The Rings of Growth is an art activity included in the first session of the Healing Our Children group-work program with women on the Tiwi Islands. In this session, the women are introduced to the metaphor of a tree as a way of reflecting on and talking about their own lives. In our training with Tiwi workers we used the Life of a Tree video to show how each ring of the tree represents one year of growth. These rings can reveal years of hardship (such as lack of water), years of rapid growth (usually during our wet season) and other unforeseen events like insect damage, fire or even crowding out by other sun-loving trees. Although these rings may be invisible to us, the scars from these tough times are always there. The Rings of growth is a metaphor that can be used to think about the long term impacts of domestic and family violence on children. We cannot see inside a child, therefore we cannot assume they haven’t been affected. It can also be used to explore the influence that positive early childhood experiences have on children’s long term growth and development. This is the purpose through which we invite Tiwi women to document their own Rings of Growth and share hopes they have for their own children’s future. This activity invites the women to draw the inside of a tree as if it was cut across the middle and each of the rings of life were exposed. The women are asked to think about what they were doing when they were a child and the memories they have about what other people did that made them feel good inside, safe and loved. These things, however small, are the things that helped them grow up and be strong. For each ring of the tree they have drawn, the women write or draw a memory of something that made them feel loved, safe and comfortable for each year of their childhood. This can include special events, favourite activities, special people in their lives, significant words said to them, important lessons they learned or stories they were told by Elders and family members. The women need at least 30 minutes on this activity to draw, colour, chat and share stories with each other. After there has been sufficient time to document significant memories and knowledge, the women are invited to explore what their drawing might tell them about hopes they have for the future of their children. Women whose childhood experiences were largely pleasant, memorable and positive, usually have similar hopes and intentions for their children’s lives. For those that are struggling in their parenting, it can be a positive way of getting back in touch with hopes that have been lost along the way. Those women with an unpleasant memory may use the opportunity to explore what positive message or learning they have taken from their experience. They may reflect on how they want things to be different or better for their children than what they had experienced. Remembering and recommitting to these intentions within the support of a group, can move women to action in positive ways with their children. In my experience, women have enjoyed making connections between their early childhood experiences with their own development into adulthood. Recently, one woman traced back her strong interest in natural remedies to her memory of being thrown in a big copper pot by her grandmother and being treated with bush medicine for chicken pox. Another first learnt to sew in school and is now actively involved in a women’s cooperative doing screen printing on fabric and making a variety of articles as her work for the dole activity. Yet another remembers her dad teaching her the rituals of the Kulama ceremony and is now instrumental in keeping this tradition alive with her grandchildren. Metaphors have the power to be transforming and insightful. The learnings that women have taken away from this very simple exercise have been delightfully surprising. The potential is unlimited for adaptation for different client groups and contexts of work. ‘Therapy on the go’ is about sharing quick insights into healing practices that anyone, any age, any gender, can do anywhere, even if you are time poor. Whether you are wanting to reclaim a sense of groundedness in your life, achieve some insight into your self or simply relax through meditation, creating a mandala can do all this and more. You could doodle one in your coffee break or create some space on a weekend to really go for it! Mandalas are everywhere. They literally exist in the cells of my body, around my garden, even the universe. Take a look around your environment; notice the patterns and be inspired. Quick reflection. Creating a mandala is a personal journey, it’s not about the final artwork. So take your time, enjoy it. Your mandala represents your inner emotions and thoughts at a particular point in time, through the shapes, colours and materials you use. Don’t think about it too much. Go with your gut instincts and see where your body takes you. Quick instructions. Gather your choice of materials. If drawing is your preferred medium, try pencils or pastels on large paper. If you like collage, almost any crafty materials or articles from nature work. Things like coloured or patterned paper, buttons, pipecleaners, feathers, fabric, ribbons, lace, wool, match and popsicle sticks, crushed eggs shells, , jigsaw pieces, bottle caps, leaves, dry grasses, small shells – the possibilities are endless. It could be as simple as a black pen and white paper or a stick and sand. Start by drawing a large circle. If you like use a compass or trace around a plate. Then in the centre of the large circle, draw a very small circle or glue a centre piece. Work outwards from there, using the ‘mandala dance method’. What’s that? You’ll have to watch the video. Basically, you draw a line (or glue items) radiating out from your centre at 12 o’clock, 6 oclock, 3 and 9 o’clock. Then you can divide each of these sections in half again, so you have eight lines. Keep adding lines, patterns or craft bits to your mandala until you fill the whole circle. Try experimenting next time with black paper or a canvas board. Quick inspiration. An artist friend of mine, Alison Dowell recently ran a mandala making workshop for International Womens Day. Watch her quick instructions including her very cool ‘mandala dance’ here. Here is a great picture summary, courtesy of one of my favourite websites where there is lots of inspiration. Use your mandala as a centrepoint for meditation, to decorate a wall or turn it into a coaster. Above all, enjoy the experience! You’ll never know what you learn about yourself, if you don’t try therapy on the go. Metaphorical Drawing as a Tool to Build Relationships of Attachment between Foster and Kinship Carers and Children in their Care. The Northern Territory is over-represented when it comes to Aboriginal children in out-of-home care. And despite the Aboriginal Placement Principle being adopted, many Aboriginal children still find themselves placed with non-Aboriginal foster carers because they continue to be removed from their families and there are not enough Aboriginal carers. Not surprisingly, after all the trauma these little tikes have been through, it can be a battle for the Department and the Carers to make the placement work. Often these children haven’t been able to build a trusted relationship of attachment to their primary carer because of traumatic events in the family, let alone the strange adult they now live with. Last week I was invited to participate in the Foster & Kinship Care Expo hosted by Foster Carers Association of the NT. I decided to engage the children in a fun drawing activity which foster and kinship carers could later take home and use to explore their relationship together. It goes something like this. Children are asked to think about if they were an animal, what kind would they be? If they get stuck, I discuss with them the different characteristics of animals. Some are shy and quiet, others are happy and excited, while some are wild and angry. You get the picture! They are invited to then draw the animal that most closely resembles them, using their choice of drawing materials. I had crayons, pastels and textas available. I encourage them to fill in the whole page, drawing the habitat that the animal finds itself in on a daily basis. At the expo, some children chose to do several animals describing the different parts of themselves. Others, chose to include family members or friends represented by different animals in their picture. The kids had lots of fun, but the real work happens later. Foster carers were invited to use my Take Home Sheet which offered ways of interviewing the child about their picture. You can learn a lot about what is going on for your child by talking to them through the animal eyes, so to speak. It is much easier for Aboriginal children to speak in third person through telling a story, than talking directly about their own experience and feelings. At home, foster carers are also invited to draw an animal picture. This can be used to explore the relationships between the two animals, how well they get on, and what needs to happen for the animals to trust each other. Having this one-on-one time with the child, is a purposeful and meaningful way for the child to build a connection, using the safety and playfulness of their imagination. These kids deserve our full attention so avoid any chance of distractions like turning off your mobile. If you’d like to read more about the questions to use when talking to children, download my Take Home Sheet here Build Relationships and Connection for Foster Carers and their children. In my counselling work, I’ve written fictional stories with children about different animals and other characters, that is based on their own experiences. It’s a beautiful way to be able to help them communicate what they haven’t been able to express before. And help them make sense of what happened along the journey! Never underestimate the power of play as a tool to share difficult experiences, communicate feelings and strengthen relationships! 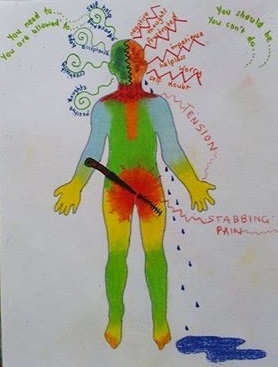 Body Drawing: An art therapy approach to healing from chronic pain. This week I sliced my finger. I was cleaning our ceiling fan blades, something I’d been trying to do for months. In the first instance, I fell into a pit of anger and frustration because I couldn’t finish the job. Ruminating, I stared at the ceiling, clasping a bunch of tissues which filled up with blood over my painful little pinkie. To the distracting but somewhat comforting beat of my throbbing pulse, I eventually pulled myself off the sulky road I was heading down, and contemplated how I might now constructively fill in the rest of my day. I decided to do something I enjoyed – some drawing or painting or both. Half an hour later, I consulted the first aid book locked away in my brain and decided a dose of Betadine and a couple of strong bandaids was all that was required. Ironically, this is the same process I went through when I popped a disc sweeping up the floor in January. However this injury was much more serious and I haven’t yet fully recovered. I lead an active lifestyle and see the glass half full most of the time, but this pushed me to my absolute limits. The mental anguish of being bed bound is much worse than physical pain and I could have easily slipped into depression, if anger and frustration had gotten hold. I began thinking about the things I consciously do to give myself the best chance of healing without letting the world crumble down around me. Here are my 3 tips for healing from chronic pain, keeping your spirit intact! Listen to what your body is telling you to do. The voices of ‘experts’ in treatment have valuable things to offer but not the only answer. My doctor, physio and chiropractor all had different opinions about my back injury and how it should be treated. The conflicting advice I received was confusing and my back seemed to get worse. Eventually, I refused to do some of the exercises because it didn’t feel right. I had to force my doctor to refer me for an “unnecessary” MRI which revealed a type of degenerative disc disease that he knew nothing about it. I ended up doing my own research to find a path of recovery for myself. In desperation for pain relief, I found an acupuncturist/physio who confirmed what I suspected all along. Don’t do any exercise that causes pain! He cut me back to one exercise and that was the beginning of my recovery, five months after my initial injury. I know if I ever do this kind of injury again, I have a first aid plan, based pretty much on “Treat Your Own Back”. I also know I have a really strong gut instinct which steers me in the right direction. Put your mind on a leash. This is the hardest thing to do when you are in constant pain. Give it some slack and your mind will take off, leaving you feeling powerless. Worry and self doubt tried to convince me that I might never be healthy and strong again. I was also plagued with guilt for lying around and not contributing to the functioning of our family household. A turning point for me came when I created a Body Drawing. On one of my worst days, I lay down and quietly meditated on how my body felt for a few minutes, noticing the pain, tension, and other sensations. Then I took a piece of paper and drew what I had noticed. Looking objectively at what I had drawn, I knew I had to take positive action to not let my mind dominate, as it was contributing to avoidable tension in my body and inhibiting recovery. The Body Drawing is a good exercise to repeat several times over the course of recovery, so that you can appreciate the positive steps forward you are taking and that change however slight, is happening. Find creative ways to keep doing things you enjoy. One of the most difficult things with chronic pain is not being able to do things you love. For three months, I wasn’t able to sit. I either had to lie on my back or stand. And standing for long periods of time wasn’t good either. I became teary and upset at not being able to do the things I normally enjoy like gardening and bike riding (I had just bought a new mountain bike). Now when I look back, I am grateful for the down time I was forced to take. I taught myself how to set up a business and website and even went to some free business seminars, standing on my feet throughout the whole training. I wrote my first blog flat out on my back because my thoughtful hubby bought me a bed desk. It’s important to stay connected to the things you are passionate about, within your limitations. I couldn’t work in the community garden, but I still went along and chatted to the gardeners doing all the hard yakka. I took up new pursuits like Universal Healing Meditation and Playback Theatre which have added value to my healing process. Think creatively and you can find a way, perhaps with a little help from some painkillers now and again! The Mind Game of healing from chronic pain or injury is a constant challenge. Just keep strong hold of that leash, and breathe. 2014 is starting to feel like a tragic year. Two heartbreaking airline disasters are making the world an unsafe place to explore. The actions of uncaring, uncompassionate politicians are shining the international human rights spotlight on Australia. And even our neighbourhood is mourning the loss of unexplained suicide. Even though none of these events have affected me or my family directly, it feels like my safe and secure ‘cone of comfort’ is slowly being smothered as layer by layer another blanket is added on top. I am heavy and weary. I am trying to breathe. Earlier this year, I was particularly sensitive to what was happening around me. I was even told by my doctor to stop watching the news and using Facebook, as it would depress me too much. I did for a few weeks until my sadness about the world subsided. Momentarily. You cannot avoid it. You cannot tune out entirely. So what do you do with these feelings that you carry? It feels like some sort of “bystander trauma”. But this term has been used to describe those who have witnessed their loves ones die or seriously injured at the scene of an accident or the like. So it is probably not the right term to use for those of us watching on as the bystanders suffer. Then again, some of the images we see on media are pretty graphic. It practically feels like you’re there. How can the majority of us who may not be directly affected by tragedy or injustice express our sadness for the grief and suffering of others? How can we express our own feelings of losses…like safety and security in the world….or nationwide compassion towards those being oppressed? Art is used in a therapeutic context to assist those directly affected by grief, loss and trauma to “confront emotions, overcome depression, integrate traumatic experiences and find relief and resolution of grief and loss” (Malchiodi 2007). But I believe it is also useful to those of us on the sidelines, watching the tragedy unfold before us and watching the bystanders grieve. The process of making art is a sensory experience, not a cognitive one. It gives us a safe place to express feelings we don’t have the words for or an audience available to listen. So after the tragedy of MH17 this is what I did. If like me, you’re feeling the weight of the blankets smothering you…watching the violence, the despair and the tears of the world, as you try to draw breath, why not give it a go? Find a piece of paper. It could be a A4 sheet, scrapbook or journal. Gather something to draw with e.g. textas, pencils, pastels, paint – whatever you prefer or feels right for you. Gather some collage materials if you have more time. I used the newspaper with the feature story of the tragedy. Use the materials in front of you to express your thoughts and feelings in whatever form you choose, concrete or abstract. You do not have to use words. When you are finished, take some deep breaths and acknowledge what it feels like in your body right now. By the way, don’t think that you haven’t got time for this. Even if you’re sitting at your desk, grab a sticky note and a pen and doodle to your hearts content. Making art is good for you. It might even make you feel like you can come out from underneath the blanket and carry on. References: Malchiodi, C. (2007) The Art Therapy Sourcebook, 2nd edn. McGraw Hill Publishing. This week Christine and I have been preparing for the CAAPS Open Day. CAAPS will be celebrating 30 years supporting Health and Wellbeing in the Northern Territory. One of the things we’ll be offering visitors is an opportunity to make some art. Art therapy is a non-threatening, creative and stimulating way to engage people in stories about their lives. This form of self expression doesn’t even needs words, as the story transforms itself from the person’s body, mind and spirit onto the blank paper. While we are using this activity for a bit of fun, it also benefits people who are experiencing illness or pain or are seeking to make major changes towards a healthier lifestyle (such as giving up drinking or smoking). The process invites them to think about the things that will help them move towards healing and a healthy life, rather than dwelling in the symptoms they might be experiencing. This exercise was helpful to me recently in my awfully slow recovery from chronic back pain caused by a bulging disc. I suffered with chronic pain for four months. My ‘strong and healthy picture’ helped me to stay hopeful, patient and connected with the things that support me in good health, so that the negative thinking and pain didn’t pull me back down. It could have been very easy to slip into depression if I didn’t keep reminding myself that recovery was possible. Drawing on Malchiodi’s ‘Symbol of Health’, we’ve called this exercise developing ‘A strong and healthy picture’. These words seem to resonate with Aboriginal folk. Christine and I took an hour and a half of relaxing time to draw and create our own picture using this process. Step 2. Create your “strong and healthy picture” using the materials provided. (We had textas, pastels, magazine cuts/pictures, fabric, glue and scissors available). Step 3. Is there anything missing? Add the things you would like to have more of in the future. Step 4. Take your picture home and put it in a place to remind you about what keeps you strong and healthy and any future goals. At the end of our creative session, I invited Christine to reflect on her picture. What is your picture about? It’s about the old man telling stories for kids and the land. About painting too. He teaches them how to make the camp fire. Doing dancing and singing. Catching kangaroo and yam. How do all these things keep you strong and healthy? Why are they important to you? It’s the way he teaches young people, to keep our knowledge strong. And telling us, how to hunt, how to do [culture things]. When you see the picture it’s going to tell you clearly how you’re to do things. Where do you see yourself in the picture? Here, where the land is. It keeps me strong in the nature. How we go to hunt. How we go to catch something to feed for ourselves. There’s a lot of things we can get from the sea – seafoods. Even something from the land, bush tucker. How do you feel when you’re out there on country? Good. I feel great. And it makes me get lots of ideas to think. If I go through the bushes and to the beach, ideas come to me. Is it like ‘strong thinking’ out there? Yes, feel strong in my mind. If this picture could talk to you what would it say? If family went to the beach for hunting or something, it will tell you everything you can get. It would say “I’ve got all the food that you will need”? Creating a positive picture of health and wellbeing can serve as a reminder during difficult times of where you want to be, so that you don’t slip back into bad habits or spiral into negative thinking and behaviour. You don’t even need to be ill or suffering to benefit from this uplifting activity. Why not take an hour to indulge yourself this weekend? Find a spot where you can be alone, put on some relaxing music and get creative!